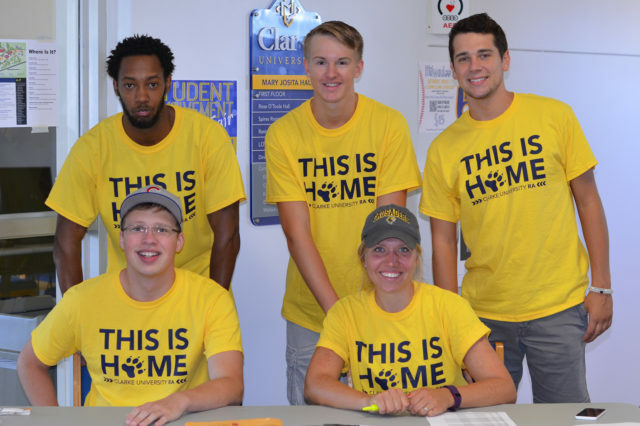 Resident Assistants (RAs) are peer advisers and educators who live and work with student residents to assist them in addressing their personal, interpersonal and academic needs within the residence hall and college community. RAs foster a sense of belonging and build community by getting to know residents, planning and implementing floor/hall activities and programs while maintaining a secure environment by addressing policy violations. Most importantly, RAs genuinely care about their residents and have the desire to help younger students succeed. RAs report to the assistant director and/or senior manager of their respective residence area. Interested? Contact the Office of Residence Life. What qualities make a successful RA? Common characteristics include: personal warmth, social maturity, a sincere desire to assist in students’ personal development and transition to college, openness to new experiences, willingness to be challenged, capacity to deal with change, ability to manage personal emotions, ability to deal with a wide range of human emotions and work with a variety of personalities and lifestyles without judgment. RAs should also possess patience, a sense of humor, strong communication skills and the ability to complete paperwork in a timely manner. Because the position is a commitment of time, emotion, talent and energy, an RA should have a demonstrated ability to balance his/her own pressures of academic and personal responsibilities. Successful RAs are willing and able to live within both university and residence life policies. How much time will I spend a week as an RA? Theoretically, to the residents you serve, you will be a resident assistant 24 hours a day, 7 days a week. This position is a lifestyle choice because being an RA means being a role model. It is important to understand that residents will always see you in the RA role, and therefore the standard placed on you is higher than that of an average student. Dual roles of the RA are to build a community and to help students develop in emotional, social and cognitive realms. This is often done through intentional programming. The RA is responsible for developing social activities for the floor/hall as well as programs that would foster growth in other areas from which their residents may benefit (i.e. “Study Skills,” “Dating Etiquette 101,” “Budget Tips,” etc.). Training is provided for all RAs. What does it mean to be on duty? On duty RAs serve as the first level of response for situations occurring within the residence halls. Being on duty means that you are available to respond to issues in the building(s) and complete walks with a co-RA addressing policy violations, facility concerns, etc. Duty shifts are 8 p.m. – 8 a.m. Monday-Friday and 8 p.m. – 8 a.m. on weekends. The number of duty shifts per semester varies depending upon the size of your staff. What are some reasons I may be released from the RA position? You may be dismissed from employment if you fail to fulfill the requirements of the position, violate a policy or law, are insubordinate, are no longer a student at Clarke or fail to maintain the minimum semester GPA requirement. What is the payment for the position? RAs receive a single room with cable television service, utilities, high-speed internet, land-line connectivity and $1800 towards their meal plan/year. Most rooms include a personal bathroom. Why should I be an RA? This position is invaluable in gaining training for future jobs as it develops skills employers want including: demonstrated leadership, crisis response, supervision, confrontation, confidentiality and mediation skills. RAs also have the opportunity to create and positively influence the on-campus experience for 20-45 students through personal leadership.